One year after losing his partner in a volcano rescue, former International Rescue Team member Raymond Bryce is called back into service by the Blue Ridge City FBI. A military group named SURGE has stolen several nuclear weapons and a leading seismologist and threatened disaster if the White House doesn't comply with their demands. 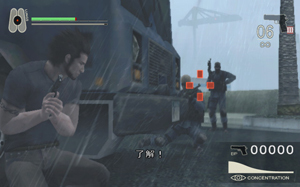 The player controls Ray through a variety of scenarios including natural disasters, terrorist shootouts and rescue missions. Ray has to stay alive by watching his various damage meters, including for his lungs and heart. Ray collects Survivor Points for rescuing civilians and Battle Points from defeating members of SURGE.